* Joe KM1P did not have time to calculate a corrected reading. He sent me his captured wave file and I used Spectrum Lab to calculated the difference frequency. Because of my potential bias, I did not make any subjective measurements of when I thought the best time to measure would be. I simply took Spectrum Lab's automatic calculated difference of 137 simultaneous A and B readings and calculated the average. AA4RP GA Good copy on K5CM - weak copy on W6OQI. Used Spectran and direct reading on a Yaesu FT-847. K5CM OK Good sig but the QRN was bad as might be expected in the summer. Thanks for doing the WC run. K6APW CA Noise S5 OK S5 to S6 poorer quality reading of signal B. WC S9. K6OQK CA I got some very interested traces showing both the A and B frequencies with some very well defined points to compare across the span. This was a very thought provoking FMT. Many thanks to you and Pam. K6YAZ CA Connie very weak and spread out; unable to measure spread. Marv good stable signal. Used Spectrum Lab in delta cursor mode between off-air signal and local marker generated by my HP 3336B offset by about 4 Hz. KC0VSJ MO Your Signal was fine tonight.. My process is improving; but I still am making mistakes in the “heat of the moment. Freq A was problematic - but vc I seem do have done better measuring Freq-B by its self. Lessons learned - run Laptop on battery and don't try to use a 250hz filter on the radio. Next time I'll try 500hz filter for some more 'working room'. Wait till next week! KD2BD NJ Thanks to you and Marvin for another great FMT challenge. All carriers were measured individually using my usual carrier phase tracking method. K5CM was received with fair signals. W6OQI was noticeably weaker and not much above the noise level. Little fading on either signal. Results were frequency measurements over time and averaging readings during periods when the observed frequency was the least volatile. +0.375 Hz Doppler observed for carrier 'A' was applied to corrected" reading 'B'. KM1P MA Pressed for time this week ... only got the uncorrected B measurement done. N5PWG TX Good sig from both stations. VE2AZX QC Your signal was 55.I have submitted the corrected B frequency from your published frequency A and my measured delta (7.843 Hz)The B frequency corrected from the error on freq. A (-0.15 Hz) is : 3555432.546 Hz. This value is probably not as reliable - since the freq. A and B measurements were not done simultaneously. Thanks for running these FMT's. VE2IQ ON Another great test.This time the program counted 1832 beats covering 1964559 samples; so that's 1072.357532 samples per beat. This time we were sampling at 8200.397 samples per second; so the beat frequency is 7.6471 Hz. W0PHD MN B tone average was varying .8 Hz A tone was even worse. At least no tornado in area like last week. W1PW AZ 80 meter signals were very weak (rst 3-3-9) from Oklahoma - probably due to the still 'pre-sunset' conditions. Static crashes from nearby T-storms were extreme too. WC signal seemed to have lots of Doppler but was S-9. W3CSW PA The QRN level was at about S7 - but you maintained a solid S8-S9. I'm into yet another processing method here in hopes of getting a bit closer to ground truth. W3JW VA Signal strength conditions were somewhat below average and QRN was less than most recent tests. Doppler effects (as observed on SL waterfall display) were significant but not as severe as recent tests. Most results were obtained with SpecLab. Was able to make relatively few valid counter measurements on the A and B keydown signals. 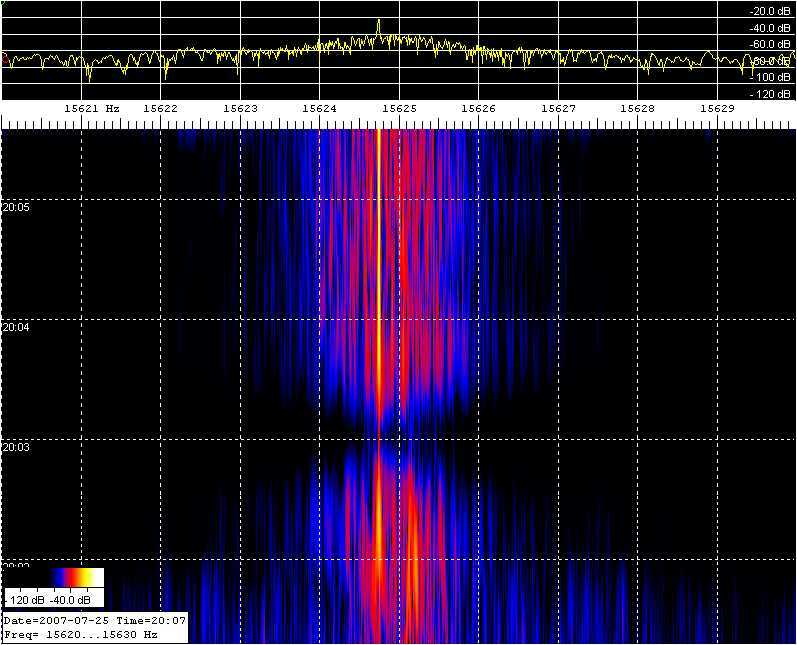 WB9FIP WI The Doppler spread lower in freq was quite apparent on analysis of K5CM run . West coast run was down in the noise - a very difficult challenge. Thanks for the fun! With the continued very close readings of several participants plus my own analyses of several captured wave files, I believe it is fair to say that a nearby signal (less than 10 Hz) can be used as an accurate indicator of Doppler. Close examination with FFT software and audio editing software indicated that selective fading does show up even at these close frequency spans (I will put some photos up soon). I think most expected this outcome at these extremely close spans, but it has given us a base to start from as well as developing our ability to measure to sub milliHz resolution. Starting with the next FMT of this type, we will increase the Span to approximately 50 Hz. This can of course still be measured with most FFT software or audio editing software and a single receiver. Participants should be thinking about how they will measure two simultaneous signals, as the span is increased beyond 3Khz. See Burt's capture of W6OQI July 25th. ....... (Burt is in ground wave range, about 8 miles from Marvin). Bill, VE2IQ and Brad, WB9FIP turned in impressive "corrected" readings this week. Both "hitting the nail on the head"!!! This makes two weeks in a row for Bill.